Learn how to naturally whiten your teeth while detoxifying your body at the same time! Many people are obsessed with white teeth. We associate white with clean and healthy. In fact, each year, Americans spend approximately $1.4 billion on tooth-whitening products — and that’s just over-the-counter solutions. As a person ages, the adult teeth often become darker due to changes in the mineral structure of the tooth, as the enamel becomes less porous and phosphate-deficient. Teeth can also become stained by bacterial pigments, foods and vegetables rich with carotenoids or xanthonoids. Certain antibacterial medications can also cause teeth stains or a reduction in the brilliance of the enamel. And even ingesting colored liquids like coffee, tea and red wine can also discolor teeth. It is pretty easy to whiten your teeth in the short term, from salt, chalk and charcoal, to baking soda or hydrated silica — all these substances whiten teeth. They “whiten” by removing the top layer of your tooth and exposing a new cleaner layer. That doesn’t sound so great when you think about actually removing the protective enamel that surrounds the dentin of each tooth. * Go to the dentist and they’ll bleach your teeth. This is dangerous and the risks associated with tooth whitening include tooth sensitivity and damage to the roots of teeth. * Buy an at-home bleaching kit. They generally use a high concentration of carbamide peroxide to achieve the desired result. Carbamide peroxide can cause chemical burns to the skin and gums in addition to damaging the stomach if swallowed. * Whitening toothpaste. This is actually a marketing ploy. Bleaches in toothpastes are useless because they get rinsed away before they actually do anything. And if a toothpaste is too abrasive, it can wear away the outer layer of enamel on a tooth, exposing the yellowish dentin beneath. become so discolored they appear blue or translucent. In extreme cases, people must have their teeth capped or replaced because the enamel becomes too thin from over-whitening. Once again, when one is whitening their teeth, they are actually stripping away the top layer of enamel, exposing the whiter layer beneath. Instead, how about an all-natural way to remove stains from your teeth and to encourage detoxification in the body as well!? Oil Pulling is an ancient Ayurvedic tradition that removes stains from the teeth. 1) It helps to pull out toxins from the gums which can stain teeth. 2) It assists in expelling mucous and phlegm which can contribute to staining around the gum line. 3) It helps to remove deeply embedded debris that have been stuck between teeth and the gum line. 4) And the most important reason why it works: the lipids of the oil help to literally draw out many of the stains in the enamel, which can not be washed out by water alone. This is because many stains are fat soluble only, otherwise in a water-based mouth we wouldn’t have any stains. So they are unlikely to be removed, unless oil is present to extrude them out. All you need is an organic, cold-pressed oil. The traditional oil recommended is sunflower. However, I’ve used coconut, olive and a variety of others. See more information on oils here. When Should I do the Oil Pull? It’s best to do the oil pull first thing in the morning on an empty stomach. However it really can be done at any time. Take about 2 tablespoons of oil in the mouth, and swish it through the teeth gently for 5 minutes. You want to prevent the body from reabsorbing the toxins that are released so you don’t want to keep the oil in your mouth for longer than 5 minutes. Spit the oil out into the trash (once it hardens it may clog your sink). Repeat one or two times more if you have the time. Rinse the mouth out with warm salt water or with baking soda mixed with water. 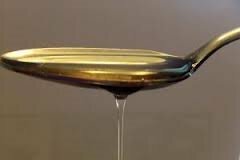 When the oil has become saturated with all the toxins it has pulled out, it will become somewhat whitish and a thinner, milky consistency, depending on the type of oil used. This process is quick, easy and can be done first thing in the morning! It’s a whole lot less expensive then the ‘professional’ route. And not only does it not cause you HARM, but it’s actually BENEFICIAL to your health! Prefer to see a video of how it’s done? Check out Daniel Vitalis’s video below!